MOVIE SYNOPSIS: Swanilda notices her fiancee Franz is infatuated with the beautiful Coppélia. 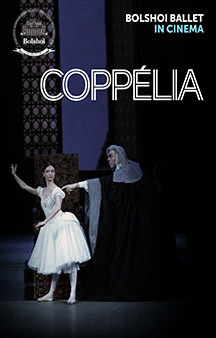 Nearly breaking up the two sweethearts, Coppelia is not what she seems and Swanilda decides to teach Franz a lesson… The Bolshoi exhibits a fascinating reconstruction of the original choreography of this ebullient comedy. The company’s stunning corps de ballet shines in the famous “Dance of the Hours,” and its principals abound in youthful energy and irresistible humor in this effervescent production.